My 4 year old thought he could plant a stick and it would turn into a tree if he watered it, so I thought this would introduce him to the concept of a root. Wash the pit, to remove the flesh, but do not remove the brown outer covering, this is the seed cover. Stick 4 toothpicks into the pit to a depth of about 5mm. 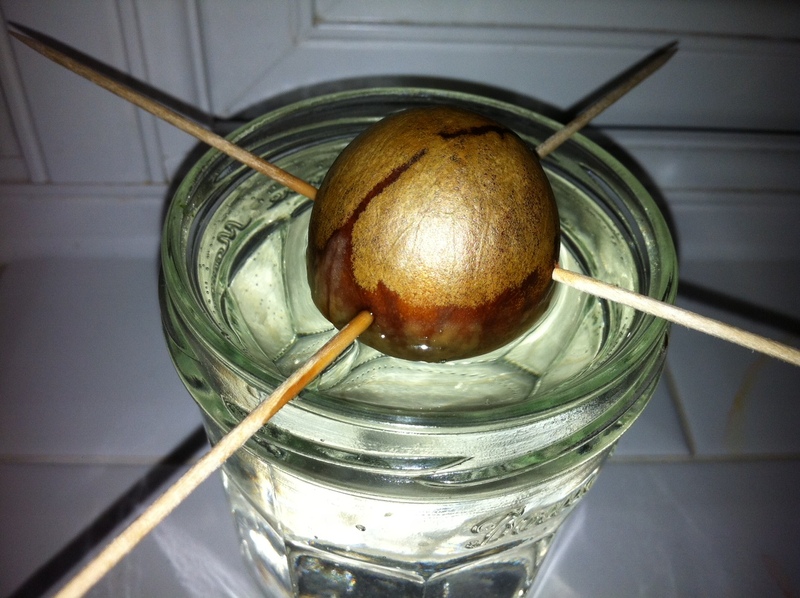 Fill a glass jar with water, and place the pit on top, balanced with the toothpicks. It should be half covered with water with the pointed end up. Leave it on a window sill or somewhere it will get lots of light. Change the water every 2 days, this is to stop mold and contaminants damaging the roots. Make sure you keep the base submerged in water. Wait and watch, the brown outer layer should wrinkle and come off and the pit should start to split and a root come out of the bottom. Further instructions and the science behind it to to follow! « An outdoor craft adventure! Now here’s something we should easily be able to do – I have 4 avocados in the fridge – will get onto this one right away!